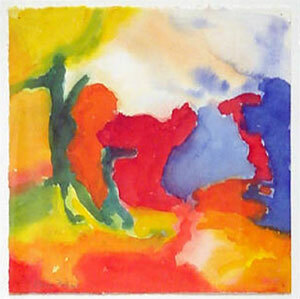 Sandstone Images 6, watercolor, 16.5" x 16.25"
Of her work, Perkins writes, "My work is mainly abstract with color defining the space and form. The inspiration comes from places, landscapes I have seen and many different influences in my life, which include people, conversations etc. Color to me is very important and great stimulus in what I paint. I work with watercolor, pastel and collage. I use charcoal on large paper to help free my thinking and working. My career in England was Occupational Therapy, always with a particular interest in art and painting. I attended the Harrow Art School taking an evening course in basic painting and drawing for many years. When we arrived in Iowa City I was able to continue my training at the University of Iowa Art Department on a part time basis. Eventually I felt confident enough to work on my own in a studio in the basement of our house. A great influence in Iowa has been the feeling of space, the clear skies and sun and atmosphere of encouragement to explore and develop new ideas."